Larry Grosskopf is a Clinical Psychologist at the San Antonio State Hospital, with a thirst for computer knowledge. He is married to Marta, and they are raising two active children, their daughter Zoë is 11, and their son Jackson is now 9. 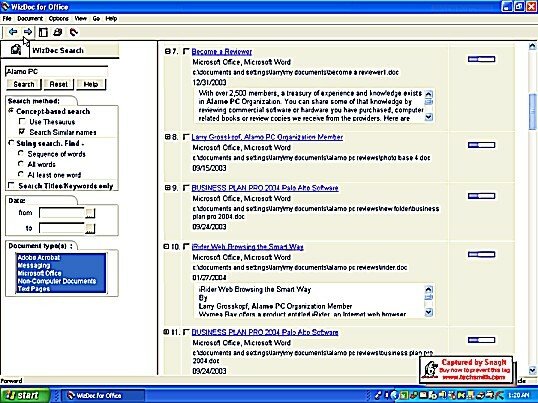 WizSoft, Inc. is the publisher of a nifty search engine software program called WizDoc for Office that lets you perform searches for data on your computer. Like many of you, I try to organize my data and files in some manner. However, my filing system and organization is often haphazard and files end up on my computer in places where I do not expect them to be. Naturally, when I go to look for them, and cannot find them, I either panic or start questioning my sanity. In WizDoc for Office, I have found a program that helps me avoid such melodrama. This is more than your typical search engine, in that it allows you to do string searches as most of us are very familiar with but it also allows you to do “concept-based” searches. I will talk more about that later in this review. 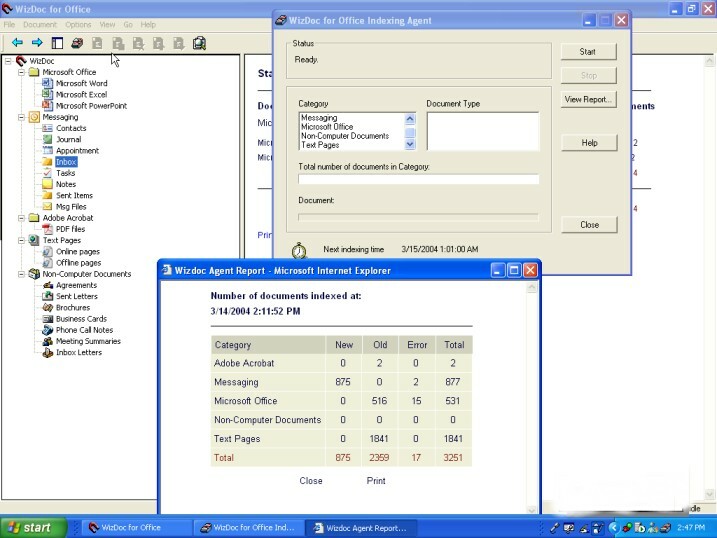 WizDoc for Office is designed to work with Microsoft Office products such as Word, Excel and PowerPoint documents but also works with Microsoft Outlook e-mail messages and attachments that are part of the e-mail message. It can also search Acrobat PDF files, text files and online or offline web pages. 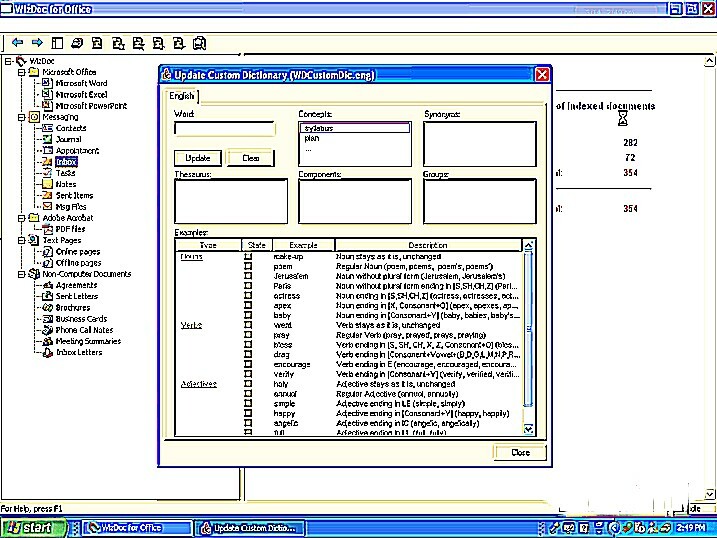 When I installed the program, it began with a Master Setup Dialog box offering you installation options such as installing IE Version 6 or installing MSDE (Microsoft Data Engine) if you don’t have Microsoft SQL server or MSDE installed already. MSDE is the recommended database for this program to use. Although I did not install it that way, there is a way to configure it for use on a LAN (Local Area Network) as well. After installation, when you first use the program, you use what they call the “Set Tree Menu” to select the document types and folders that you want to index. One slight drawback is that once you select a category, Microsoft Office for example, you must index all of your MS Office parameters, such as PowerPoint, Excel and Word files. You can’t just select Word files for indexing. Indexing is very powerful and depending on how many files are indexed, it may be a time-consuming endeavor. However, it can run in the background on your predetermined schedule and will then index any new documents or files it finds. Another part of this procedure worth mentioning is that you can save data from Indexing as a Log file including just indexing errors (like files that could not be opened) or you can save all the details about the indexing task. Finally, you can view a report after the Indexing Agent has completed its task or you can view your indexed document statistics telling you how many documents are indexed and what type of documents and files they are. As an example, I have included a screen capture of a subsequent use of the Indexing Agent, the report and statistics gleaned from this indexing task. Typical string searches are one way to use this software, in which you enter a string of text and search for exact words or phrases. You can do Boolean searches (using AND, OR, or NOT) like psychology AND counseling OR therapy NOT psychiatry. Your search can stipulate only titles or keywords or you can hunt for the string all through the whole document. The second method in my view is the most unique and interesting feature of this software, the “concept-based” search process. The program actually comprehends the meaning of the text you enter in a descriptive query as well as the text in the document and then produces documents about the subject but also other relevant documents that may not have the same words but that have a synonymous meaning. There is no particular system of wording rules you have to abide by and the software interprets the meaning of the query from normal language usage. There is also a user-defined thesaurus and dictionary which helps the software work even better. Using these built-in tools can expand the accuracy of these concept-based searches. Finally, it displays phonetically similar words or names when a word or name is misspelled, either in your text query or in the document itself. Names like mine are rather unusual, but suppose someone sent me an important e-mail or document that spelled my name Grosskoff instead of Grosskopf, this program would still find the document. This is a process entitled “Soundex” which they have incorporated into this program. Doing actual searches provides the user with a variety of options to delimit the search, such as filtering by searching only for documents between certain dates. String searching will search for all the words, at least one of the words in your string or words in the proper sequence from your query. There is a thesaurus, which will search for your words and words that are semantically similar. You can also add to, edit meanings or update the data integrated into the dictionary and thesaurus via the Updating Custom Dictionary command from the options portion of the menu bar. What do you need to use this program? It runs on Windows systems including Windows 98, Me, NT, 2000 and XP. In my testing, I am using a Windows machine with an Intel P4 3.06 GHz processor running Windows XP Professional. You also need Microsoft Internet Explorer version 6 when using the indexing portion of this program. The suggested list price for this program is $250.00. However, you can purchase this program online from the WizSoft web site for $199.00 for a single user license. There are also multiple user licenses available there with a 5-user license selling for $749.00.